On Friday December 2nd, WagonWheel Presents… welcomes a trio of outstanding singer/songwriters in Boss Caine, Joe Solo and Dave Woodcock to Shakespeares for what will be our final show of 2016. Advance tickets priced at £4 are available from http://www.wegottickets.com/event/363517 or entry on the night will be £5. Doors open 8pm. On top of releasing fourteen albums since 2004, Solo has written books and had them written about him; runs a research project on the Hull Pals Battalions in the First World War; has worked with underprivileged children to help them write their lives in song; run a weekly radio show; and still found time to open for the likes of Chris Wood, David Rovics, Attila the Stockbroker, Otis Gibbs, Robb Johnson, Edgar Broughton, TV Smith, Paul Simmonds, Emily Portman, Pete Wylie, The Blockheads and Billy Bragg; whilst his songs have been played by John Peel on Radio One, Mike Harding on Radio Two and Tom Robinson on BBC6Music. 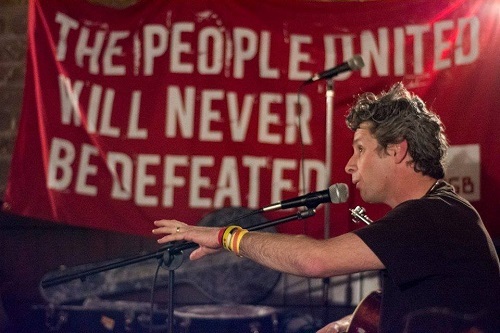 In May 2015 Joe helped create WE SHALL OVERCOME, a campaign pushing for a positive response from the music community to the poverty and hardship inflicted on ordinary people by the government’s austerity program. Since October 2015 the movement has put on 550 gigs in 135 towns and cities across 8 countries on 3 continents raising an estimated £225,000 in cash, food, clothing and bedding for those hardest hit. 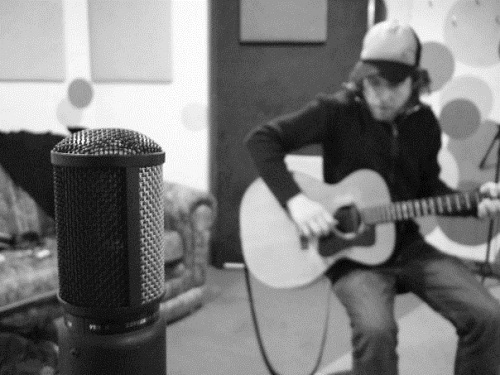 WSO scooped the People’s Choice gong at the annual Yorkshire Grassroots Music Awards on 16th October 2015, and on the back of his efforts The Morning Star named Solo ‘Human Being of the Year’. 2016 saw Joe and The Hurriers front-man Tony Wright collaborate on ‘May Day Festival of Solidarity‘. The event, which brought together voices from music, poetry and politics to celebrate International Worker’s Day, took place in Barnsley on May 1st and a packed house saw stunning performances from artists as varied as Grace Petrie, Phil ‘Swill’ Odgers, Attila the Stockbroker, Lizzie Nunnery & Vidar Norheim and The Wakes. 2017’s event is in planning. 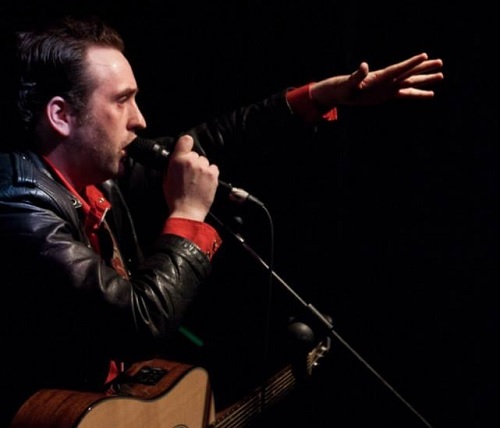 In October 2016 he was awarded the ‘Outstanding Songwriting’ prize at Yorkshire Gig Guide Grassroots Music Awards for his work on the album ‘Never Be Defeated’ telling the stories of the men and women of Hatfield during the 1984-85 Miner’s Strike. 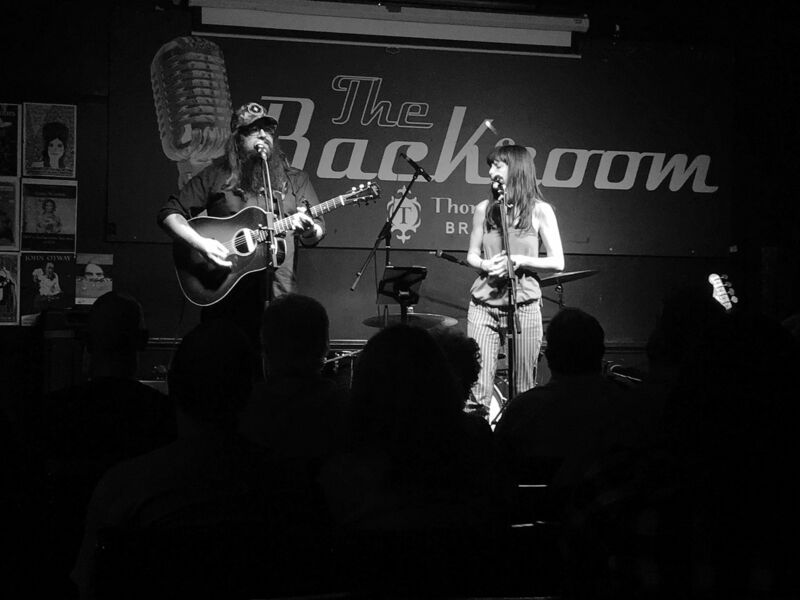 Described by Americana UK as “The next big thing from Sheffield”, Dave Woodcock & The Dead Comedians released latest album Medicine in 2015 to great critical acclaim. The follow up to their 2011 album “Poisoned Nights & Bar Room Nights”, it found its way on to several end of year ‘best of’ lists and saw them raise the bar once again.. They deliver booze soaked rock ‘n’ roll echoing Springsteen, Strummer and with a nod towards the likes of The Hold Steady. Tonight Dave plays a solo set.